Garden City: Doubleday and Company, 1977. Fine/Fine. First edition. Fine in fine dustwrapper. Inscribed by the author: "Inscribed for , a gift of his parents on his birthday, March 4, 1977, with heart-felt wishes for health, luck, and achievements. Immanuel Velikovsky. Princeton, N.J." Further discredited pre-history from the once-respected psychiatrist turned scientific pariah. New York: Doubleday. 1977. First Edition; First Printing. Hardcover. Very Good+ in a Very Good+ dust jacket. Spotting at top of text block. First Edition stated 10.00 price on flap intact. .
NY: DOUBLEDAY.. Fine. 1977. First Edition. Advance Complimentary Copy. SIGNED by Immanuel Velikovsky on the publisher's printed slip afixed to the front endpaper. Fine in a close to fine dj. (Couple of short edge nicks & attendant shelfwear at spine ends on dj.) Books signed by the controversial author of such books as "Worlds In Collision" & "Earth In Upheaval" are notably uncommon. (LR) . Garden City, New York: Doubleday & Company, Inc, 1977. First edition. Hardcover. Very Good/Very Good. 16 pp. illustrations. Speculating on the veiled history of the destruction of the Hittite and Mycenaean civilizations by a mysterious sea-faring race, Velikovsky (1895-1979) attempts to prove that Ramses III, the Egyptian ruler who is generally credited with defeating these marauders, actually lived some 800 years later than what is commonly thought, and that these sea-borne raiders were actually Greek and Persian mercenaries. 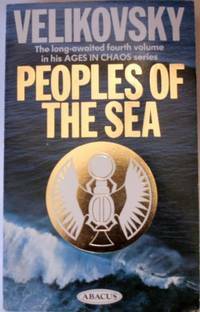 The concluding series in Velikovsky's Ages In Chaos series, in which the controversial scientist argued that the accepted dates assigned to the Egyptian dynasties are widely inaccurate. Presentation copy, inscribed by Velikovsky to pioneering American psychoanalyst Hyman Spotnitz (1908-2008) on a prefatory blank leaf. Original black cloth binding, with blue and gilt titles. A bit of light wear to the corners and tips, with some occasional mild edgewear to the dust jacket. Better than very good. Inscribed by Author. 1977-03-01. Good. Ships with Tracking Number! INTERNATIONAL WORLDWIDE Shipping available. May not contain Access Codes or Supplements. May be ex-library. Shipping & Handling by region. Buy with confidence, excellent customer service! Doubleday & Company, Inc, 1977-03-01. Hardcover. Used:Good. Doubleday & Company, Inc.. Hardcover. 0385033893 New Condition. . New. Buccaneer Books. Hardcover. POOR. Noticeably used book. Heavy wear to cover. Pages contain marginal notes, underlining, and or highlighting. Possible ex library copy, with all the markings/stickers of that library. Accessories such as CD, codes, toys, and dust jackets may not be included. Garden City, New York: Doubleday & Company, Inc., 1977. Fine condition in a Fine dust jacket. Not price clipped ($10.00). A fresh, crisp, and clean copy. Bright, square, tight, and unmarked. Sharp corners. Not a book club edition. No owner's name or bookplate. A radical reconstruction of ancient history by the author of Worlds in Collision. Endpapers Maps of the Middle-East. 16 pages of illustrations. Index. Bound in the original black cloth, with blue spine label. Includes dust jacket.. First Printing of the First Edition. Hardcover. Fine condition/Fine dust jacket. 8vo. xviii, 261pp + 16 pages of illustrations. New York: Doubleday & Company, Inc.. 1977. First Edition; First Printing. Hardcover. 0385033893 . Very Good in a Very Good dust jacket. Stated First Edition. ; The Ages in Chaos Series, Vol. 5; 8.30 X 5.60 X 0.90 inches; 261 pages; Original unclipped dust jacket protected by archival Brodart cover. All domestic orders shipped protected in a Box. .
Doubleday, 1977-03. First Edition. Hardcover. Very Good/Very Good. Light wear to covers. Text clean and unmarked. The binding of the book is slightly cocked. Moderate wear to the DJ. Some chips and cracks to the DJ. First Printing. Garden City NY: Doubleday & Company Inc., 1977. A reconstruction of ancient history. 261 pages. 16 illustrations. Pages good condition, clean. endpapers illustrated with maps. Black cloth, blue label with gilt title and bands on spine. Edges lightly worn. Black and white DJ shows light wear at edges and corners. VG+/VG. Hard Cover. New York: Doubleday, 1977. First. 5 1/2 x 8 1/2 in. Black cloth binding with gold stamping over turquoise panel on spine; spine slightly bumped at top; very small tears at jacket corners and at top and bottom of spine. In acetate jacket. Maps of the Middle East printed in brown ink on the endsheets. Another challenge to accepted historical thought by this radical scholar. London, United Kingdom: Sidgwick & Jackson Ltd, 1977. Illus. unclipped DJ with some light fading to front, small closed tear at top and some light fading to spine, black cloth, foxing to top page edge, 261pp Theorizes that Ramases III was a 4th Cent BC pharoah.. 1st Edition 1st Printing. Hard Back. Fine/Very Good. 150x230mm. NY: Doubleday, 1977 Remainder spray bottom edge, else nice copy in price-clipped jacket, protective mylar cover. 261pp. The concluding volume of the Ages In Chaos Series. . First Edition. Near Fine/Near Fine. Hardcover. Garden City: DOUBLEDAY, 1977. Book. N-Fine. Hardcover. 1st Edition. A square solid tight clean un-read un-opened copy. This copy does have the usual browning to pagedge and some minor soil to the front board. The jacket has rubbing wear,edgewear,some chipping. The concluding volume of the Ages in Chaos series. Over-all a pretty nice copy..
Garden City, NY: Doubleday & Co., 1977 261pp, dust jacket in protective mylar. A continuation of the Ages In Chaos series. Remainder spray bottom page edges.. 2nd Printing. Hardcover. Near Fine/Near Fine. Cloth. Doubleday & Company, Inc.. Hardcover. 0385033893 Like New Condition. . Fine. London: Sidgwick& Jackson, 1977. First Edition. Cloth. Fine/Fine in Protector. 8vo. NEW YORK: DOUBLEDAY. VG/VG-. 1977. DJ IN GLASSINE, SOME EDGEWEAR AND PRICE CLIPPED . New York, New York, U.S.A.: Doubleday, 1977 Remainder spray bottom page edges, knicks in dust jacket, now in protective mylar. 261pp.. First Edition. Hardcover. Very Good/Very Good. Cloth. Book Club Associates, London, 1977. 261 pp including index, b&w plates, edges and end-papers lightly foxed, small clean tear to base of d/j spine, else very good copy in like d/j. Doubleday, 1977. 1st. Hardcover. A VG+ tight copy in a VG+ bright dj. Garden City: Doubleday, 1977. First Edition, First printing. Hard Cover. Stated first edition. NEAR-FINE IN NEAR-FINE DJ WITH ORIGINAL $10.00 PRICE/. Garden City, New York: Doubleday & Company, Inc., 1977. Fine condition in a Near Fine dust jacket. A remarkably fresh, crisp, and clean copy. Bright, square, tight, and unmarked. Sharp corners. Not a book club edition. Not price clipped ($10.00). No owner's name or bookplate. A radical reconstruction of ancient history by the author of Worlds in Collision. 16 pages of illustrations. Endpapers maps of the Middle-East. Index. Bound in the original black cloth, with blue spine label. Includes dust jacket.. Second printing. Hardcover. Fine condition/Near Fine dust jacket. 8vo. xviii, 261pp + 16 pages of illustrations. New York, New York, U.S.A.: Doubleday, 1977 261pp. Dust jacket in protective mylar.. 2nd Printing. Hardcover. Very Good/Very Good. Cloth. Garden City: Doubleday & Company, 1977. A clean, tight, unmarked copy. First printing. Full black cloth binding. Map endpapers. 261pp. Illustrations. Dust jacket is price-clipped, slightly rubbed at tips, and offered in a new mylar cover.. First Edition. Hard Cover. Very Good/Very Good. 8vo - 8" - 9" Tall. New York: Doubleday & Company, Inc., 1977. First edition, First printing. Book is in Very Good + condition. Boards are clean, not bumped. Fore edges have a small amount of wear. Interior is clean and legible. Not remaindered. Dust Jacket is in Very Good condition. Tiny bit of shelf wear/rub. Tiniest bit of wear, chipping and a couple of tiny closed tears along the edges. Not price clipped. Dust Jacket is covered by Mylar wrapper. Thanks and Enjoy.. First Edition. Hard Cover. Very Good +/Very Good. Doubleday, 1977. 1st US. Hardcover. A Near FINE+ tight copy in a Near FINE+ bright dj. New York, New York, U.S.A.: Doubleday & Company, 1977. Jacket is chipped on edges, back flap partially detatched. Boards have minor shelfwear. Pages are clean, text has no markings, binding is sound.. First Edition. Hard Cover. Good/Good -. 8vo - over 7¾" - 9¾" tall. Doubleday & Co Inc, New York, 1977. Hard Cover, 8vo, First. Book Condition: Very Good. Very clean and tight. Dust Jacket: Good. Light edgewear. Not Clipped..
Garden City, New York: Doubleday & Company, Inc, 1977. A continuation of the Ages in Chaos Series. Binding tight, pages unmarked. Illustrated Size: 5 3/4 x 8 1/2. First American Edition.. Hard Cover. Very Good/Very Good. Buccaneer Books, 1997-02. Hardcover. Good. Book Club Associates, London, 1977. Book Club Edition. Hardcover. Very Good/Very Good. 261 pages. Boards have no wear, rubbing or soiling. Edges of dust jacket have moderate wear. Edges of pages are mildly foxed. Quantity Available: 1. Category: History; Inventory No: 17090091..
London: Sidgwick & Jackson, 1977. . First English Edition. 8vo. 261pp. Illustrated. Black cloth. Fine in dust-jacket tanned on the inner flaps. The fourth volume of the 'Ages in Chaos' sequence. .
LONDON: BOOK CLUB ASSOCIATES. Book Club edition. Hard cover with dust jacket. Small tears and surface wear on DJ edges. Small areas of soiling/surface wear on DJ generally. No printed price on DJ. Not price clipped. Some foxing/staining on inside of DJ. Black boards with gilt titles on board spine. Page edges are foxed. Clean, tight pages. Strong binding. No inscriptions. Black and white illustrations(plates). Size: 12mo - over 6¾" - 7¾" tall. Location: NB6 . Very Good. Hardcover. First Thus. 1977. Garden City, NY: Doubleday Books. 1977. First edition. . Hard cover. Very good in very good dust jacket.. 261 p. Contains: Illustrations. Audience: General/trade. . WORLD HIST-This regular size hardcover is near fine with remainder spray in a nf jacket. brown w/white lettering . Condition: Very good in very good dust jacket. Doubleday & Company, Inc, 1977-03. Hardcover. Good. Garden City: Doubleday, 1977. Book. Very Good. Hardcover. First Edition. Well-worn spine-ends. Three tears where covers fold over into flaps, both front and rear. Garden City, NY: Doubleday, 1977. Hardback with dust jacket, 261 pages. Book has no writing or marks except previous onwer's name on second page text is clean and legible and has only light wear. Dust jacket also shows light wear and chipping..
London: Ward Lock. Undated reprint. Red cloth, titled black. Spine a touch sunned . Very Good. Hardcover. reprint. Garden City, NY: Doubleday & Company, Inc., 1977. First Edition. Hardcover. Good+/Good+. Cloth in DJ; 261pp; DJ glued to boards & protected by mylar sleeve, faint mark to top edge, text unmarked, binding is tight, Good+/Good+ condition. Reconstruction of ancient history, continuation of the Ages in Chaos series. Illustrated with photos.